Do you suffer from problematic skin issues? I suffer from dry skin, especially on my ankles and elbows. Skin MD Natural recently contacted me for a review and I graciously accepted this challenge. Why challenge? Due to my dry skin, I haven't found a product that helps since an un-named company discontinued a favorite of mine a few years ago. As many would agree, scratchy and dry elbows/ankles = a turn-off with your significant other. They may not mention it during intimacy but, if it bothers you then you know it bothers them. I've always wanted soft and sensuous skin but, unfortunately I have been cursed with rough patches. 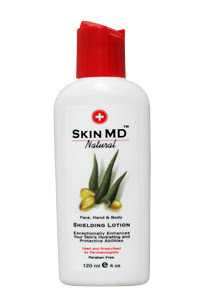 The product that I had received for review was a 4oz bottle of Skin MD Natural Shielding Lotion. Though, I have only been using this lotion for a few days, I am beginning to feel a difference in my skin texture. I wish that I had taken a few pictures before using the product! I'll have to put a sticky note next to my computer as a reminder to take photo's of the next beauty product I review. Without a visual, it can be difficult to achieve the same excitement, I apologize for not being able to provide this for you. Skin MD Natural is a shielding lotion, a very special type of lotion helping the skin restore its integrity, enhance its protective functions so that the skin is able to heal naturally and regain its youthful appearance. Skin MD Natural works by bonding with cells of the skin's outermost layer to form what works as an invisible shield. This layer of protection prevents environmental irritants and pollutants from penetrating the skin, while sealing in the skin's own natural oils and moisture, helping resolve the dry skin condition. Skin MD Natural uses only the finest natural ingredients, and is focused on urging the skin to be active, and to use its own moisture to effectively heal itself. It is not oily or sticky, doesn't sit on top of your skin leaving a greasy residue on everything you touch, it doesn't rub or wash off easily, is hypoallergenic, fragrance, colorant and paraben free and dermatology tested. *Small amount goes a long ways, my bottle doesn't feel much lighter after several uses. *Noticeable changes in texture and softness after a few days of use. *This lotion is also available with SPF-15 at an additional cost. *100% Natural! No harsh chemicals. *Virtually no scent to the lotion. I enjoy scented lotion products. *I prefer a thicker lotion, however there is a PRO to this as the lotion does moisturize your skin deep within despite of the lighter texture of this lotion. Would you like to own a bottle of this shielding lotion? You can purchase this product directly from the website for $18 (W/SPF-15 $25). Request a FREE sample if you are unsure about purchasing this product. Include a SASE posted with $0.44 inside an envelope addressed to the address below and we will send you 2 sample packets containing 3 - 5 uses. •Skin MD Natural Sample Offer - for the original formula of Skin MD Natural. •Skin MD Natural SPF 15 Sample offer - for the Skin MD Natural with SPF 15. •Skin MD Natural Combined Sample Offer - for one of each sample. Would you like a chance to win your own 4oz bottle of Skin MD Natural Shielding Lotion? Entering will be simple, please follow the directions to be entered. MANDATORY: You must leave a comment with the answer to this question or your entry will not count. What are your biggest skin issues? *Follow me on twitter @mrsmiki77 & tweet about this giveaway (Daily). Come back and post your "tweet" link and username. Please make sure that you link to this post and use @mrsmiki77 in your tweet. I have not and will not be paid for this review. This company sent a product sample for my evaluation and honest review. This review contains our own personal and honest opinions about the product involved. I hold no responsibility between you and the sponsor and/or products that you purchase. My biggest skin issue, is I have very oily facial skin. I am almost 40, and I still have teenage skin. Not blemishes anymore, its just oily..
definitely dry skin in the winter. hormonal acne is my big problem. booo. My biggest issue is dry skin and wrinkling. Thanks for the chance. This time of year with the cool, dry air my biggest skin issue is dry skin. Would love to give Skin MD Natural a try! My biggest skin issue has always been my large pores. I have very oily skin on my face, chest, back, and arms. I hate it. I keep getting spots discoloration on my face! hate it! My biggest skin issue, is I have very oily facial skin. My biggest skin issue is that I have dry skin, especially in the winter. I have very dry skin that starts to flake in the winter time. Yuck. My biggest skin issue is dry, craked skin. I get it all over this time of year. I follow your blog. Thank you! My biggest issue is dryness, thanks for the chance! My biggest skin issue is dry skin - especially in the winter. My hands and feet (esp. my big toe on my right foot!) are dry and itchy year 'round, but even more so in the winter. I also have a little exzema on my forehead that pops up occasionally, and my elbows get really dry as well.